Superstar Rajnikanth’s second daughte Soundarya Rajnikanth had got married last month ago to Vishagan Vanangamudi of Apex Pharmaceuticals, who had likewise acted in the gangster drama Vanjagar Ulagam released a year ago. 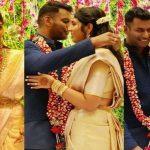 The wedding was a grand affair that saw the presence of who’s who of Kollywood and TN Politics. Following her wedding, Soundarya regularly updates moments in her life featuring her son Ved and husband Vishagan, and after her recent tweet posting a picture of her with Superstar and Vishagan at Akash Ambani – Shloka Mehta wedding, today she posted another heartwarming picture. Soundarya tweeted a lovely snap of Ved playing with Vishagan, and captioned it “And that’s what a blessing looks like.. My Boys..Ved..Vishagan..My life..Blessed..Grateful.. Gods are with us”. Soundarya is currently producing the MX original series Ponniyin Selvan based on the classic novel of the same name by Kalki.